When you sit down at the beginning of the week, plan out your work schedule and group together similar tasks. This will improve your productivity because you’ll be spending less time switching between tasks. How much time do you have available after your usual work hours? This is the most important question to ask yourself and figure out. It’s important that you take an honest look at your schedule and figure out your time. Remember that you’re not just accounting for time away from your home; you’re also figuring out how long it takes you to get ready, commute to your job, cooking, cleaning and any other recurring schedule commitments you have. Then remember to think about time for family, friends and yourself. Once you’ve got this all figured out – the time left over is what you can realistically spend working on your goals. Now that you’ve figured out exactly what you need to do and how much time you have – you then need to balance your time efficiently. You need to cook, clean, maybe looks after your kids, have a social life, see your significant other, family and so on. Life is busy. So let’s say you work for 8 hours a day, get 8 hours sleep, and spend 2-4 hours travelling and doing other errands such as above – that could possibly leave you a good 5 hours for yourself, maybe not everyday but a good few. Most people waste their ‘me time’ hours watching TV, (guilty) Netflix, or arguing on social media. If you use this time wisely you can prioritise your day. Remember: Know what you’re working towards – Your time is limited so you should have a clear vision for how you see things working out. So now we’re all clear on how much time we have and have to balance that time – we now need to get your priorities in check. Remember not everything needs to be done all at once. 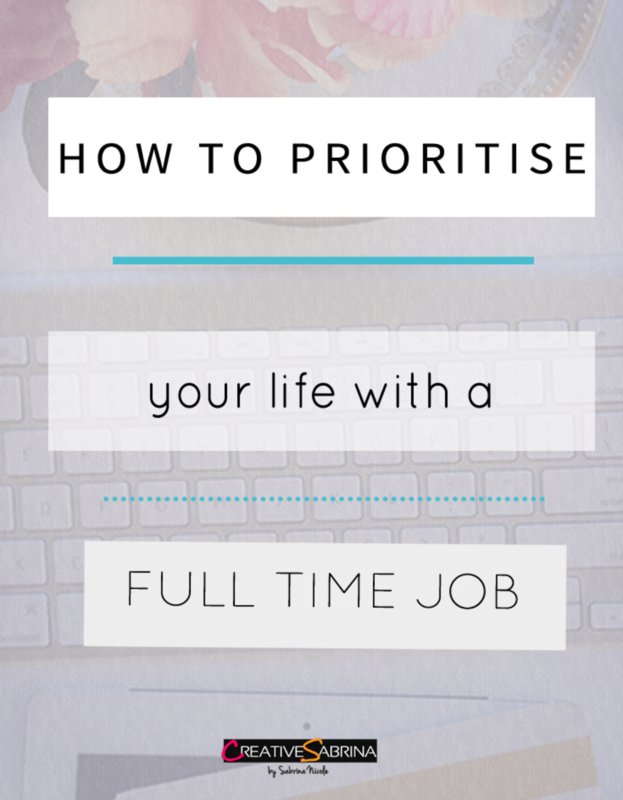 Your time is limited so make the most of it by focusing, prioritising and planning the most important work first. Eliminate distractions around you so you can focus. I define important work as things that will generate an income on completion and things with an important deadline. Also the things that will push you forward. Sometimes it’s best to work on the smaller shorter tasks first. You’re not superwoman (or man) we’re all at risk of becoming burnt out. For your own health and sanity, you shouldn’t forget to give yourself time to recharge your batteries. If you work full time 5 days a week, take one day a week for yourself. A rested mind works better. Splitting your time between what you want to do in the future and what you have to do right now is hard. Quick Tip – Use The Pomodoro Technique. It’s a time management method to eliminate burnout and manage distractions. Are you currently trying to balance your life with your full-time job? What do you do to make it all work?